People are nice. Mother Nature, sometimes not so much. People have been calling and texting us during the weekend and in these past few days making sure we are OK in the aftermath of Hurricane Matthew, which started last Friday and moved up the east coast over the weekend. 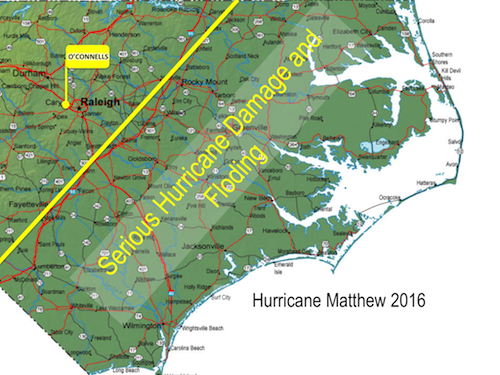 Many states were hit but it seems North Carolina got more than it’s fair share of damage. Worse, fatalities here are in the teens and may still rise. Our experience was misty rain all day Friday. Significant and steady rain ALL day Saturday (around 5″ in Cary to a high of about 9″ in Wake County, where we live). Sunday was sunny, cool and breezy, like nothing ever happened — Mother Nature’s way of clearing up the atmosphere. We did not see much TV over the weekend so we didn’t see how the national news was portraying the storm in our area. It seems much of the talk was about eastern North Carolina so I can understand people’s concerns about us. We are in Cary, NC, just outside of Raleigh. As you can see by the amateurish graphic (made by this amateur) we were on what turned out to be the safer side of the storm. But as you can see, safe by not much. People nearer to I-95 and east were hit much harder and some rivers have yet to crest but will almost assuredly to do so, causing still more damage in those areas. Knowing that hurricanes are much more damaging than Blizzards (especially in areas built to combat and recover from blizzards like Buffalo) doesn’t prepare you for the uncertainty that hurricanes bring. 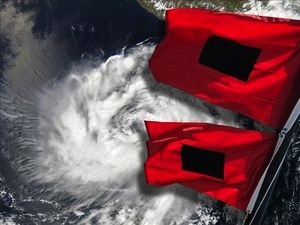 Indeed, the weather folks were often citing the hurricane’s ‘cone of uncertainty’ — which follows not only the expected track of the storm but also a significant area around the track where the storm could unexpectedly alter its course. We are fine and we are glad. But we are also thought-filled about the folks to the east, STILL dealing with mess, destruction and even death. It’s just another day for us. Not for them. Not for a while. Here’s one place you might be able to offer some help to those folks who need it in eastern North Carolina.